Another hectic day: dentist appointments, school fundraiser, basketball games. Par for the course around here lately. 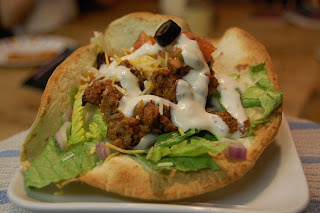 Here's a new recipe I tried for Taco Salad Made Over from the Kraft.comwebsite. I had all the ingredients on hand and the recipe goes together quickly. Making the tortilla bowl made the ordinary taste of tacos seem a little extra-special without taking any extra time. Definitely a recipe that I'll be making again and again. MEANWHILE, brown meat with chili powder in large nonstick skillet. Stir in beans and salsa; cook until heated through, stirring occasionally. FILL tortilla shells with salad greens, meat mixture, cheese and tomatoes. Drizzle with dressing. What a fun idea! We love taco salad, but never realized how simple it would be to make a tortilla bowl for it. This is really made over...and it looks amazing.